What’s more, the number of tech firms planning on making a claim is set to grow by more than half over the next three years. Our complete report ‘A Nation of Innovators – a ForrestBrown report on business attitudes to research and development’ reveals this and many more interesting insights. You can download your own personal copy here. The report has been put together following a comprehensive survey of 247 UK business leaders. It is the first of its kind in ten years and was commissioned to gauge business leaders’ appetite for innovation and identify any barriers that they feel stand in their way. From a business perspective, it is reassuring to hear that 89% of them said they planned to innovate in the next three years. That’s concrete proof that we really are a nation of innovators. The really good news from the report is that the R&D tax credit scheme has already had a positive effect on the technology sector, providing a real boost to innovation. Of those tech companies that claimed, 57% directly increased activity as a result. And the benefits don’t stop there. Many businesses were able to reinvest the funds they received from their tax credits to boost their business or hire new staff. As a sector known for innovation, perhaps it is not surprising that uptake of the government’s tax credit scheme is higher amongst technology companies than any others. But there is still work to do. Although 38% of survey respondents said their business had already claimed R&D tax credits, that means many more companies are missing out on the benefits of the scheme. Hopefully, that looks set to change, with 58% reporting they were planning to make a claim within the next three years. Great news! 9 in 10 technology professionals are aware of this government incentive. But for many businesses, there still seems to be confusion over what work qualifies. A very significant 77% of respondents did not know they could include unsuccessful R&D in their claims and 60% were not aware that R&D work relating to changes or modifications to an existing product is eligible. With the total benefit paid for 2014-15 standing at £1.7bn, just think how much UK technology companies could be missing out on. Interestingly, the report shows that many companies face barriers to innovation due to time, talent or short term thinking. But for 59% of businesses, the greatest barrier is a lack of financial resources. That is in stark contrast to the fact that 81% of those that had already claimed R&D tax credits, said they are very important to their company’s overall financial position. So whilst a claim offers very worthwhile financial benefits, it can also help to break down the barriers and create more opportunities for innovation too. If you are an innovative technology business and are not claiming R&D tax credits, look into them now. A specialist can help to identify more qualifying expenditure, boosting the value of your claim. At ForrestBrown, we are advising more than 100 companies a month on their R&D tax credit claim and so we are 100% focused on their cash generating potential. If you are already claiming, make sure you are getting your claim right. Our chartered tax team are always happy to review claims without any obligation. 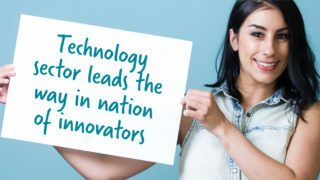 Make sure you download your personal copy of our A Nation of Innovators report and please feel free to share it with your colleagues in the technology sector. If you would like to know more about whether your work is eligible for R&D tax credits, or if you want to make sure you are getting your claim right, speak to the ForrestBrown team today on 0117 926 9022.